Digital is not just for clients—83% of wealth management firms are enhancing digital capabilities for advisors. Boston, November 12, 2015 – Most wealth management firms accept that digital channels must complement and enhance the financial advisor. They are keenly aware that if they do not deliver digital services to clients, assets may flow to firms with more digital capabilities, and they feel pressure to justify a fee that looks increasingly high alongside digital-only models. How do firms react to client and prospect pressures, and compete with lower-cost, digital-only models available through startups and established firms? 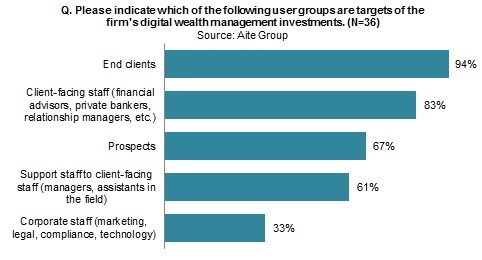 This report discusses wealth management firms’ digital wealth management plans. It provides digital wealth management spending estimates and discusses the specific client- and advisor-facing Web and mobile capabilities scoped for improvement. It is based on a 2014 and 2015 Aite Group survey of executives at wealth management firms in North America, Europe, and the Asia-Pacific. This 39-page Impact Report contains 37 figures and one table. Clients of Aite Group’s Wealth Management service can download this report.